The Arctic is changing. Melting sea ice, thawing perma¬frost and a greening tundra are some of the consequences of Arctic temperatures that have been higher in the past few decades than at any other time over the past 2000 years. Unanticipated alterations in weather patterns and ocean currents are driving changes both on land and in the oceans. CliC is pleased to release its 2014 Annual Report which summarizers the amazing number of activities that we sponsored, supported, and in many cases, initiated over the past few years. We hope you will take the time to read the achievements, as well as our plans for the coming year(s). The Randolph Glacier Inventory (RGI) is a globally complete collection of digital outlines ofglaciers, excluding the ice sheets, developed to meet the needs of the Fifth Assessment of theIntergovernmental Panel on Climate Change for estimates of past and future mass balance. The RGI wascreated with limited resources in a short period. Priority was given to completeness of coverage, but alimited, uniform set of attributes is attached to each of the $198000 glaciers in its latest version, 3.2.Satellite imagery from 1999–2010 provided most of the outlines. Their total extent is estimated as726800Æ34000km2.Theuncertainty,aboutÆ5%,isderivedfromcarefulsingle-glacierandbasin-scaleuncertainty estimates and comparisons with inventories that were not sources for the RGI. The maincontributors to uncertainty are probably misinterpretation of seasonal snow cover and debris cover.Theseerrorsappearnottobenormallydistributed,andquantifyingthemreliablyisanunsolvedproblem.Combined with digital elevation models, the RGI glacier outlines yield hypsometries that can be com-bined with atmospheric data or model outputs for analysis of the impacts of climatic change on glaciers.The RGI has already proved its value in the generation of significantly improved aggregate estimates ofglacier mass changes and total volume, and thus actual and potential contributions to sea-level rise. 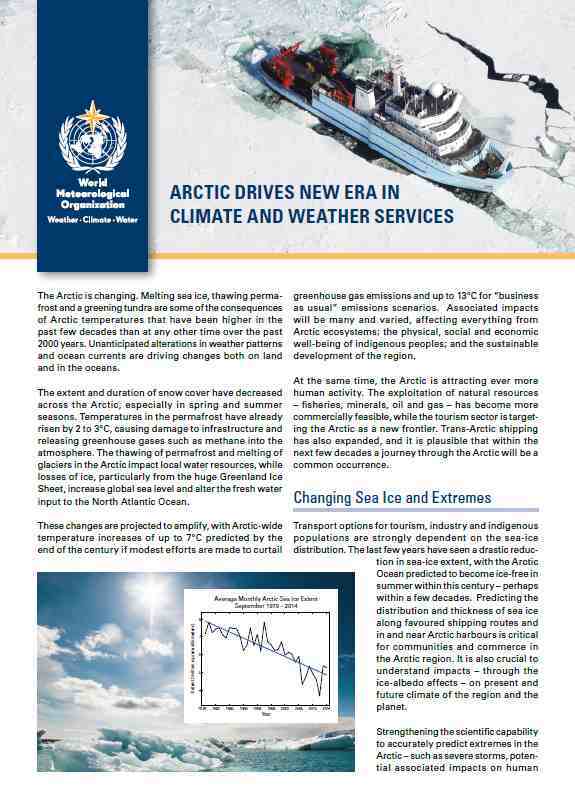 ssued annually since 2006, the Arctic Report Card (hereafter the Report Card) is a timely and peer-reviewed source for clear, reliable and concise environmental information on the current state of the Arctic relative to historical records. The Report Card is intended for a wide audience, including scientists, teachers, students, decision-makers and the general public interested in the Arctic environment and science. For the first time, scientists have identified an 'ozone hole' over the Arctic, in addition to the well-known ozone hole over the Antarctic. Unusually persistent low temperatures over the Arctic in early 2011 caused an unprecedented amount of chemical destruction of stratospheric ozone there. The authors warn that this is likely to happen again, although it is presently difficult to predict when this might be.